LAGUNA BEACH, California — Every day starting at 6 a.m. about two dozen men, mostly Latinos, arrive at a roadside site off of winding Laguna Canyon Road and wait for cars and trucks to pull up and offer them day jobs. Sometimes the pay is good, even higher than the federal minimum wage. But all too often, these men work all day and never get all the money they were promised. It happened just the day before to Miguel Lopez, 56, a Mexican immigrant who has been in the U.S. 18 years. A man hired him and two others to do some planting in a gated community in posh Laguna Niguel. They were promised $120 each for 8 hours work. Once they got there, the man pressured them to work faster and faster and when they finished in a little over seven hours, he paid them only $95. “He pushed, pushed, pushed all day and then he said $95,” said Lopez, who was appalled that the man told them to go to the bathroom outside rather than let them in to the house. There are hundreds of thousands of day laborers across the nation, a number that is impossible to pin down because most are part of an informal network that is extremely difficult to track. Some hang out on street corners, others in the parking lots of Home Depots and Lowe’s home improvement stores. Others report to an assigned area, usually sponsored by the city or community organizations. It is estimated that more than 100,000 day laborers are either looking for work or employed in an informal work arrangement on any given day, according to a 2006 study by researchers at several universities. Once confined to ports of entry along the East and West coasts, day labor is now a nationwide phenomenon that has spread to small and rural towns across America from the Midwest to the South. The research showed that about 40 percent of day laborers have been in the country more than six years. Three-fourths are undocumented. Another study by Abel Valenzuela, Jr., chair of the César E. Chávez Department for Chicana/o Studies at the University of California Los Angeles, put the numbers of day laborers in southern California alone at an estimated 15,000 to 20,000. It is estimated that the slumbering economy and tight job market has pushed the numbers of day laborers even higher. “After 2008, when the housing market collapsed, some contractors were coming to day labor centers themselves looking for work,” said Pablo Alvarado, executive director of the National Day Labor Organizing Network. The organization works to protect the constitutional rights of residents to find work, even on street corners. It won challenges to local ordinances barring the practice in 15 municipalities. The biggest victory was in 2011 in Redondo Beach, California, where day laborers were getting arrested. A U.S. 9th Circuit Court of Appeals ruled the city’s ordinance unconstitutional. The following year, the U.S. Supreme Court denied to hear the city’s appeal of the decision. There was another victory earlier this month in Oyster Bay on the north shore of New York’s Long Island. A federal court judge ruled after a five-year court fight that a law enacted to bar day laborers from soliciting work on town sidewalks and streets is unconstitutional. Now, there are more women joining the ranks of day laborers or “jornaleros” as house cleaners and child care workers. And because day laborers are usually paid cash, they’re often target of robberies, said Salvador Sarmiento, legislative director of the national day laborer group. Those assaults often go unreported because “immigrants are uncomfortable reaching out to police,” he said. But the greatest threat to day laborers is exactly what Lopez experienced: wage theft. Advocates are pushing for organized day laborer centers, either at an assigned location, such as the one here in Laguna Beach, or through a formal jobs center. But there is often opposition from the community. The National Day Labor Organizing Network is trying to establish hiring centers in North Carolina. New York City for the first time is supporting worker centers in all five of its boroughs, even providing funding in the 2016 fiscal year. The number of day laborers has grown as families find it difficult to meet skyrocketing housing prices. “It’s hard to pay rent even with two incomes,” Romero. That’s why more women are seeking day jobs. The Pomona jobs center created the Women Workers’ program earlier this summer to find day jobs for women. About a dozen women are placed in jobs — many of them to clean homes or office buildings. Because they’re placed by the center, they are less likely to be taken advantage of than those who are hired off the street. Nationally, the push is on to create an organized network to protect day workers but also to educate them so that they can find more permanent jobs. In Laguna Beach, the Crosscultural Council sends an official to the day laborer site at 6 a.m. to provide some safeguards and monitoring system. On a recent Thursday, council worker Marlene Avila was keeping a log of every worker who was hired that day, jobs that are doled out via a morning lottery. She writes down the license plate numbers of people who hire them — from individuals to contracting companies — and tries to match the right workers for the jobs. The Migrant Education Program in Orange and San Diego Counties sends migrant outreach workers to day labor sites to try to get those who might not have finished high school to do so — a long-term goal to improve immigrants’ employment outlook. 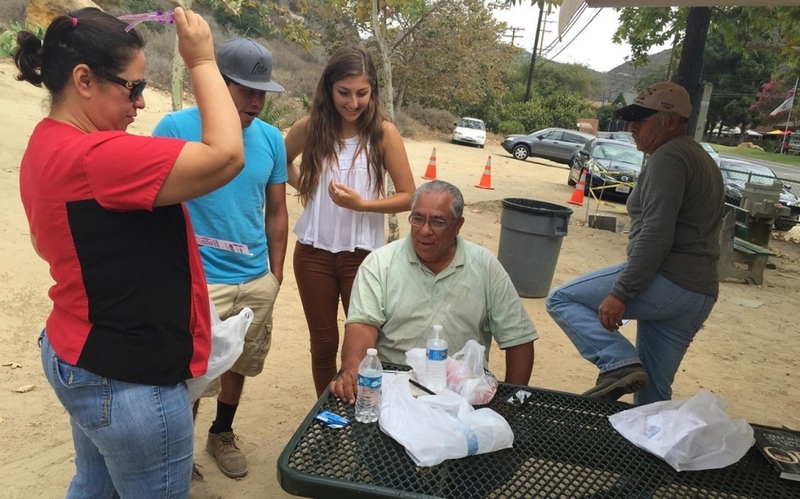 Carmela Vásquez, one of the outreach workers who visited the Laguna Beach hiring area last week, said she is working with 50 out-of-school youths aged 16 to 22. Many arrive in the U.S. and go right to work in agriculture or construction. But it’s a local 17-year-old high school senior who has received national recognition for her volunteer work with day laborers. Shira Alcouloumre has been volunteering since the age of 11, even using her bat mitzvah money to help pay for a $2,500 water fountain at the hiring site here. She teaches English as a second language to the workers. Alcouloumre founded Laguna Friends in Need, which raised more than $20,000 to pay for an awning at the site, meals, clothing and holiday presents for workers and their families. Her work has earned her a $36,000 prize as one of 15 recipients of the 2015 Diller Teen Tikkun Olam Awards that recognizes teenagers for their commitment to social good and volunteer service. “Tikkun olam” is a Hebrew phrase that means repairing the world. “I noticed one guy needed eye surgery and we took him to urgent care,” said Alcouloumre, who is greeted with broad smiles by the day laborers. When she saw that many were not eating the bread she brought them because of toothaches, she reached out to local dentists and distributed 100 toothbrushes and toothpaste tubes. A dental hygienist came to talk to them about dental care. But now, Alcouloumre is getting a taste of local opposition. The Canyon Alliance of Neighborhoods Defense Organizations (CANDO) is not keen on her proposal to establish a larger structure to expand English classes. CANDO objects to more development, which in turn brings more traffic, and is seeking a compromise to move the center about half a mile away. “The environmentalists have always been opposed to development on the side the labor area exists,” said Steve Dicterow, Laguna Beach’s mayor pro tem. The city was sued in 2006 by Judicial Watch, a Washington, D.C.-based think tank that has filed similar suits elsewhere. The citizen border patrol group, the Minuteman Project, joined protests of the hiring area. The city won. Dicterow supports a facility to teach English to the day laborers. The issue will be taken up by city staff and eventually go to the city council. Cruz Moreno, 60, has been in the U.S. since 1978 and is a citizen and father of 10. He’s a welder but “I can do anything,” he said. And he has had to just about anything because finding a permanent job has not been easy. Now, there are porta johns, a food truck, water fountain and picnic tables in the shade. “Before, it was in the wild,” Moreno said. Alavarado said that local fights against day laborers is a microcosm of the national debate over the fate of an estimated 11 million undocumented immigrants.